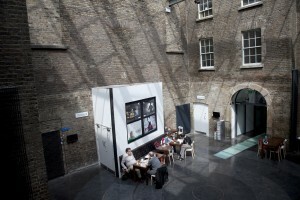 Situated in the centre of Dublin, the Irish Film Institute has both the facilities and experience to cater for any event, whether it is a screening, conference, meeting or seminar. We can provide a tailored package to suit your requirements depending on size, technical requirements and whether you have catering needs. Our experienced staff will work with you to provide you with what you require and to ensure your event is a success. Board room set up for 16-18 delegates. Modular tables available to create workshops for up to 16 people. All our cinemas are wheelchair accessible. Cinema 1 is on the ground floor and Cinema 2 & 3 and the Meeting Room are serviced by a lift. We provide a range of finger food and canapes, and drinks, and our Café Bar Manager will be happy to discuss any other catering requirements you may have. Discounted parking rates are available with Fleet Street Car Park.